This is the fourth in a series of posts covering the recently-published report compiled by Forest2Market titled “Changes in the Residual Wood Fiber Market 2004 to 2017.” Our analysis uncovered four key findings that show both structural and temporal market shifts in recent decades have impacted the markets for wood fiber residuals. This independent report was commissioned by Resources for the Future (RFF), the US Endowment for Forestry & Communities, Inc. (Endowment) and the National Wooden Pallet & Container Association (NWPCA). As global consumer trends and demands continue to shift at an escalating pace, a new Forest2Market report shows that both structural and temporal market shifts in recent decades have impacted the markets for wood fiber residuals. The report analyzes data from the US Forest Service, Forest2Market’s proprietary database of timber transactions and other scientific research to understand the relationship between the supply and demand of wood residual materials over a 10-year period from 2007-2017. The study found that there are four underlying market forces that most impacted the residual market. Key Finding #4: Wood Fiber constraints in the PNW have hindered growth and led to stagnant, but stable markets. The market structure and supply dynamics for residual material are considerably different in the Pacific Northwest than they are in the US South. Since the early 1900s, this market has focused on lumber production and sawlog harvests. As a result, pulp mills were designed to consume only conifer sawmill chips, with no log handling equipment. Landowners are not accustomed to growing pulpwood, and thinnings for pulpwood are not common, which is result of mill consumption needs and the fact that logging conditions (steep terrain and high logging costs) make thinnings only marginally commercially feasible. In the aftermath of the spotted owl crisis, which led to harvest restrictions in national forests in the 1990s, nearly half of the lumber capacity in the PNW evaporated. Since then, the demand from pulp mills for sawmill residuals has far outstripped available supply. The balance is made up by pulp logs or sawlog tops that are chipped in stand-alone chip mills. As a consequence, supply factors are the weighting influence on residual chip pricing, not demand. As evidenced below, sawmill residual chips are priced lower than chip mill chips and are always in high demand in the market. Pulp mills in the PNW are also much smaller than their counterparts in the South. The average mill consumes 500,000 bone dry tons (BDT) annually (vs. 1.1 million in the South), and the PNW market is just 15% of the size of the US South market. Pulp mills do play a vital role in the health of the entire forestry industry in the PNW, however, no other outlets for residuals exist, as neither the wood energy nor pellet markets have developed in any substantial way in the region. Loss of available timberland: The timber market in the PNW was fundamentally altered after the listing of the spotted owl as a threatened species over 30 years ago. The listing severely restricted timber sales on approximately 10 million federal acres scattered across 17 national forests in Washington, Oregon and Northern California. As log supply from national forests dried up, the mills that relied on this resource curtailed production or failed. Dimensional lumber production dropped from 21.8 BBF in 1989 to an average of 16.9 BBF during the 1990s. Current production is even lower, at only 14.6 BBF. When residual chip production from the curtailed or closed mills disappeared, chipmills that could produce a high-quality paper mill chip stepped in—albeit at a much higher cost. Pulp mills were forced to endure a cost increase, which weakened their profitability and their global cost position. Loss of marketable timber: Catastrophic wildfires and the Mountain Pine Beetle (MPB) infestation have destroyed millions of acres of both public and private timberland in the region in recent years, further limiting access to available timber. Per recent data from the US Forest Service, forest growth was 48% of mortality in western national forests, while timber harvests are a mere 11% of what is dying annually. The agency estimates that 6.3 billion dead trees were standing in 11 western states in 2015, up from 5.8 billion in 2010—and the trend continues. Increased demand shift to PNW due to supply constraints in Canada: The devastating Mountain Pine Beetle infestation in British Columbia (BC) has been well documented. Annual allowable cuts (AAC) have been reduced by about 20% from historical norms and are not expected to recover until 2080. In addition, wildfires have resulted in a loss of 25 million cubic meters (m3) in the mid-term supply, and 12 million m3 of previously-available insect-killed pine. These supply constraints are starting to show up in BC lumber production losses; current lumber production in BC is down nearly 6%, shipments are down nearly 10%, and the region’s supply continues to dwindle. As a result of these catastrophic events, the geographic shift in demand has placed pressure on available resources in the PNW. Export Demand: The PNW has a robust export sawlog market. Landowners have access to no fewer than five ports that source the Pacific Rim log trade. Nearly 2.4 million m3 of Douglas fir logs were exported in 2017. 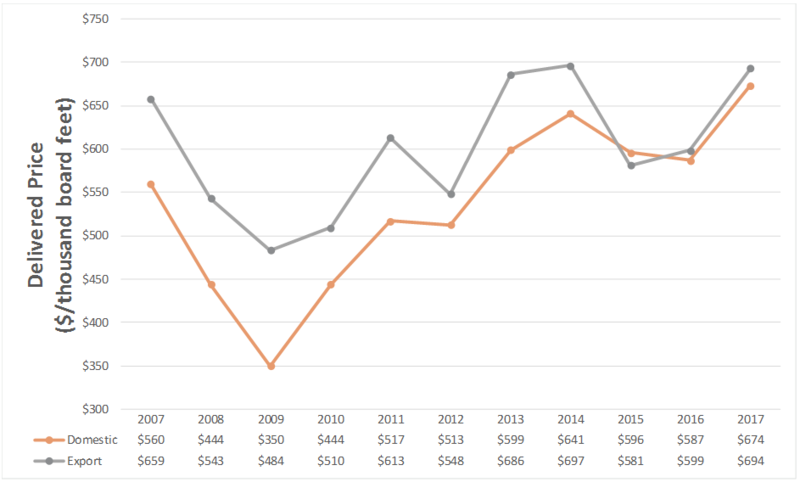 Timber inventories in the PNW have been strained throughout the study period as evidenced by the elevated sawlog price levels throughout most of the last ten years. Again, due to limited timber supply, sawlog prices recovered quickly after the lows of 2009. By 2013, sawlog prices had recovered to 2007 levels. The elevated price levels limit additional lumber and panel production and reinforce the notion that timber supply limits upside potential. Demand for sawlogs in the PNW has been robust. At the same time, domestic demand for wood chips has decreased because of pulp mill closures. On the surface, one would think that the wood chip demand decrease—just as wood chip production was increasing—would be damaging to the market price of wood chips and create chip backlogs for sawmills. This is not the case, however. Since sawmill chips get consumed first—because of their lower price and availability—pulp mills will increase purchases of lower cost sawmill chips to replace higher cost chip mill chips, a substitution that is certainly beneficial to the economics of the pulp mill and sawmill alike. Export demand has increased over the study period; wood chip exports to Asia, in particular, have shown some growth. 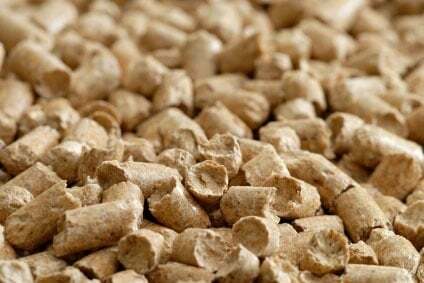 There is also a growing demand for wood pellets in Asia. Unlike the US South, however, industrial wood pellet production in the PNW is virtually non-existent. Despite the forecasted growth in pellet demand for the Asian market, the PNW is simply not in a position to capitalize on the opportunity. 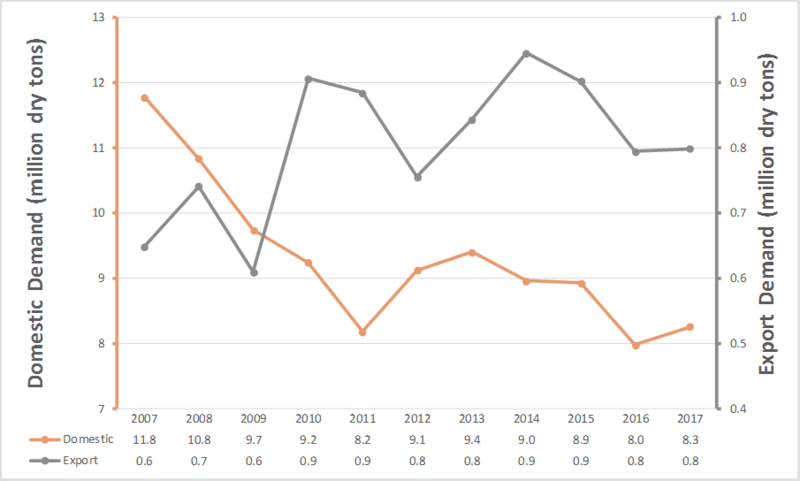 Over the last decade, the trend of conifer residual chip supply in the PNW has mirrored the lumber production trend. Supply is still below 2007 levels, but supplies recovered and stabilized by 2013, just like lumber. Since 2012, annual supply has remained above 5 million bone dry tons. Again, these supply trends show how inextricably linked the restrained sawlog supply, lumber production and eventual chip supply are. Perhaps most importantly, these trends display the limits of the market. 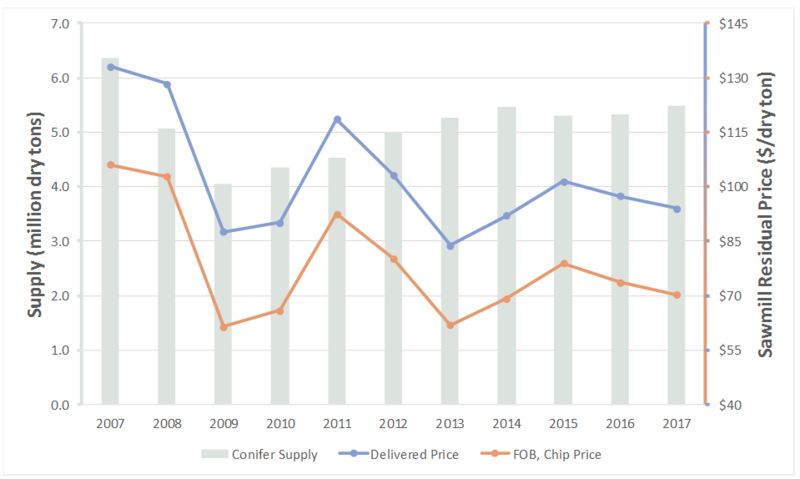 Chip prices in the PNW are volatile, and the volatility is supply driven. Sawmill residual chip prices declined rapidly between 2007 and 2009 as demand dwindled. 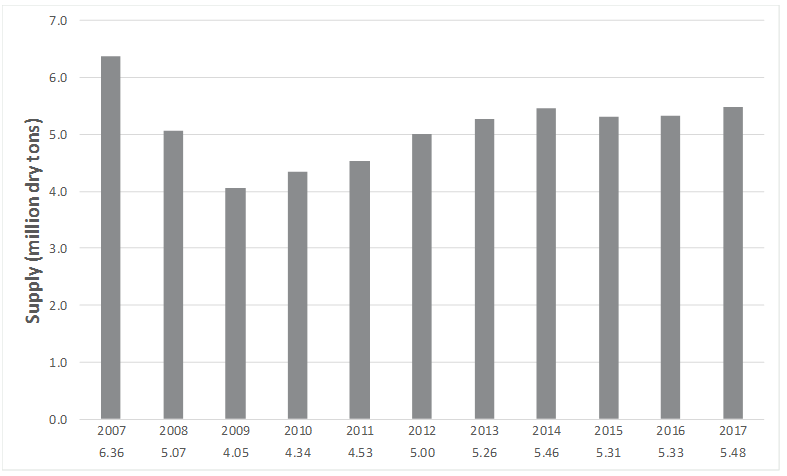 Prices for residuals were at a high between 2005 and the beginning of 2007 before sawmill production started to decline rapidly in response to the housing market crash. Pulp mills began to lean on whole tree chips to make up the deficit, and this continued through 2009. In 2010 and 2011, a spike in the market occurred as demand for export chips increased and pulp mill profitability returned. From this point, residue supply began to outweigh demand as lumber production increased. Supply has flattened in recent years, as have volatility and price. The market for all wood products in the PNW might be best described as structurally stagnant, as the region’s limited timber availability gates the size of the market. Since pulp mills, MDF and MDP facilities are highly reliant on residuals from sawmills, the sawlog resource is the key to fiber availability. Many factors restrict sawlog availability in the PNW, the largest being the lack of harvesting on federal timberland. The added demand of export markets further complicates the supply situation. In order for the industry in the PNW to grow, new log resources must be supplied. This can come through improved silviculture—improving growth rates—on private timberlands, imports from other markets or increased access to timberland that has been off limits to harvesting. Without new flows for wood resources, however, the PNW will stagnate at its current size. While this could be considered a structural change from a growth perspective, the region’s industry is also reasonably healthy and profitable. 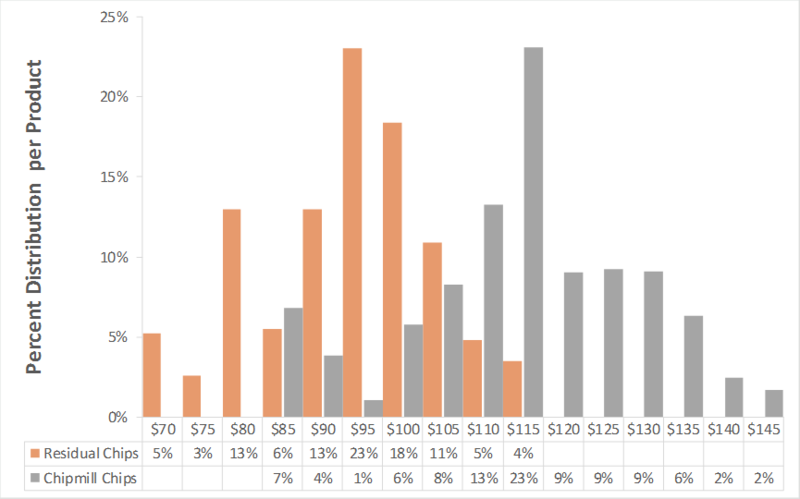 That said, the upside potential of the PNW industry is limited due to the structural changes in log supply. The lack of supply will impact the industry for years to come. With no additional log supply, there can be no additional lumber production or residual production and, of course, no new pulp capacity. The implications of the resource constraints are far reaching. For the landowner, it means elevated timber prices for the foreseeable future. For plywood and lumber manufacturers, it means the PNW is at peak production. For consumers of residuals, it means that expansion is out of the question unless they are willing to absorb raw material price increases via a product mix change. Also notable is the fact that very little capital is flowing to the PNW industry, owing in large part to the restricted log supply and exceedingly high log costs, which are some of the highest in the world. Pulp mill numbers and production have declined dramatically. On the surface, this should be alarming; however, the supply of residual chips is only about half the amount demanded by pulp mills (the rest being made up by chip mill chips). On the margin, private landowners will improve growth rates and thereby avail more timber to the market. Sawlog imports into the PNW are highly unlikely as British Columbia is dealing with its own sawlog deficit and shipments from any other region would pose too many logistical challenges. The only viable option is to develop avenues to open National Forests to greater harvesting opportunities, without which, the PNW will stagnate at its current size. ©2019 Forest2Market, INC. All Rights Reserved.